Piazza Colonna is at the midpoint of Via del Corso and more than Piazza Venezia or the Capitol is considered by Romans the very centre of the city. 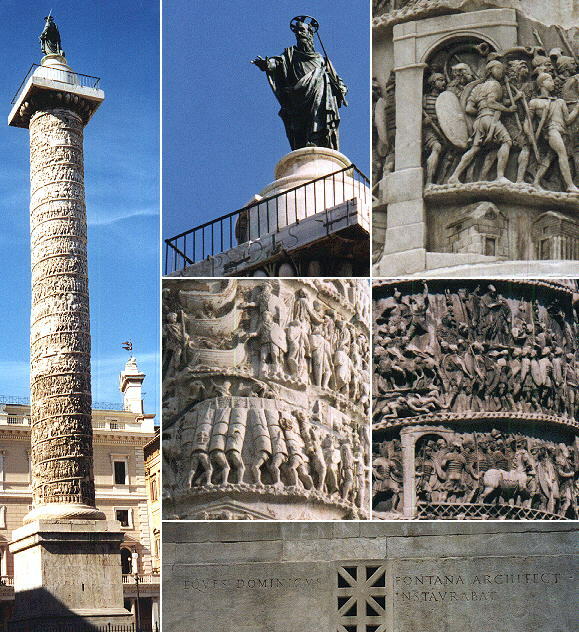 The Column erected by Marcus Aurelius and dedicated to Antoninus Pius (Colonna Antonina) adds to the idea of Piazza Colonna as the centre of Rome. The view is taken from Via del Corso (green dot in the map below). 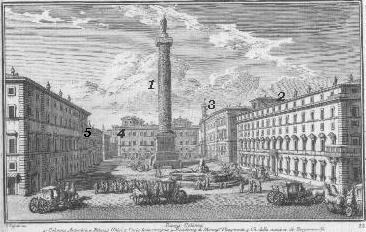 In the description below the plate Vasi made reference to: 1) Colonna Antonina; 2) Palazzo Chigi; 3) Curia Innocenziana (or Palazzo di Montecitorio); 4) Palazzo del Vice Regente; 5) Chiesa della Nazione de' Bergamaschi. 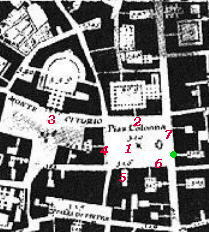 The small 1748 map shows also 6) Palazzo Ferraioli; 7) Palazzo Piombino. The only change is the Palace of the Vicegerente (Vice Governor), which was largely altered by Gregorius XVI in the first half of the XIXth century and subsequently became the Post Office (see the clock on the top). Today Piazza Colonna is the centre of Italian political life with the adjoining Piazza di Montecitorio. It was erected by Marcus Aurelius to celebrate his victories in Armenia, Persia and Germany and it was dedicated to his father Antoninus Pius. In 1589 Sixtus V restored the column and christianized it ("ab omnia pietate expurgata") by adding on its top the statue of St. Paul. Domenico Fontana was responsible for this restoration and he signed it. Like those of Trajan's Column the reliefs (although of a lower quality) are a vivid account of Roman life. 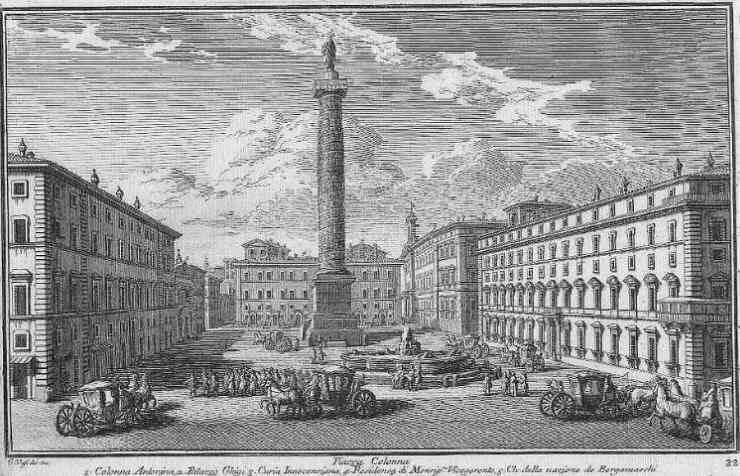 Bernini developed a project for bringing here also Trajan's Column and having the twin columns in the same place. 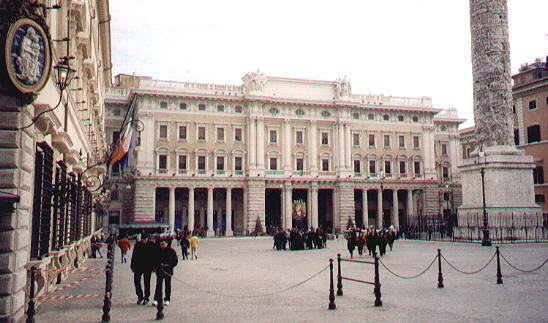 Palazzo Chigi was begun in 1562 by Giacomo della Porta and completed by Carlo Maderno. In the XVIIth century it was modified by Felice della Greca and Giovan Battista Contini. 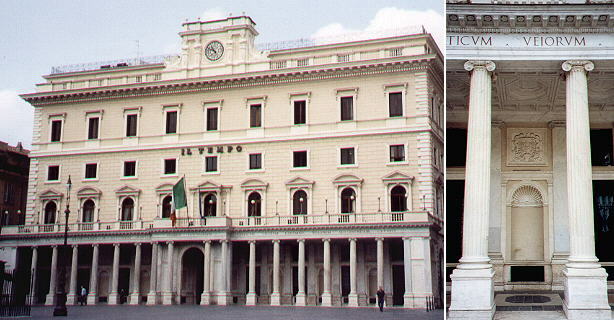 The palace is today the residence of the Presidente del Consiglio (the Chief of the Government) and has been very recently brought back to its XVIIIth century state (top picture). 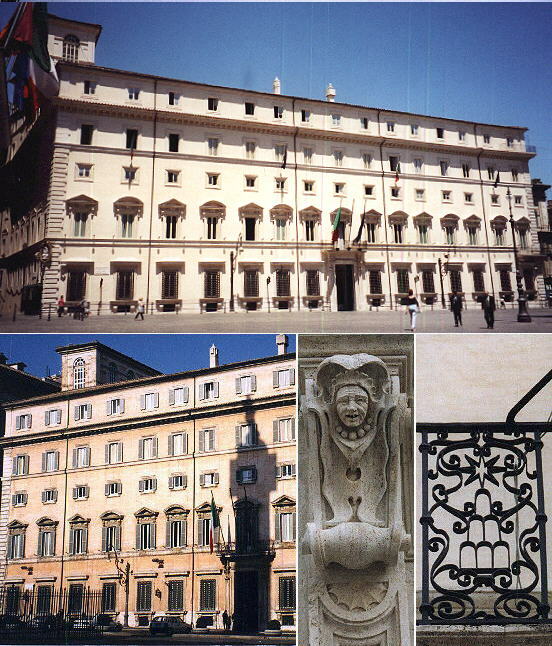 Below there is a view of Palazzo Chigi as it was until 1999 and some details of the decoration including Chigi's coat of arms (six mountains and a star). 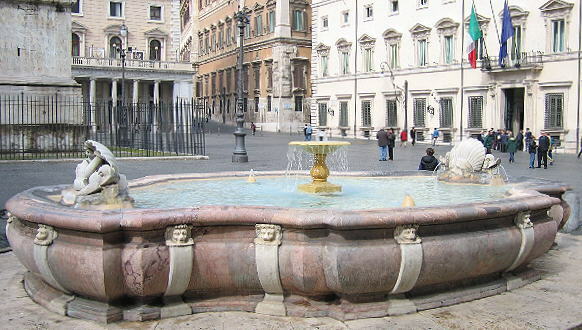 Giacomo della Porta designed this very elegant fountain which has been largely copied in Rome and elsewhere. By comparing the print by Vasi with the photo it is possible to notice that the spouting points and the central basin have been modified. This occurred in 1829. The neoclassical building erected by Pietro Camporese for Gregorius XVI (1831-46) has a portico made of Roman columns coming from Veii. The southern side of Piazza Colonna is formed by Palazzo Ferraioli (designed by Francesco Peparelli in 1627 and completed by Giovanni Antonio De Rossi in 1642) and by the little church of S. Bartolomeo dei Bergamaschi (the inhabitants of Bergamo near Milan, for many centuries an independent town and eventually a possession of Venice) (click here for a list of national churches in Rome). The façade of the church was designed in 1731 by Carlo De Dominicis. Next to it there is an interesting XVIIIth century portal which comes from a demolished palace near Mausoleo di Augusto. The eastern side of Piazza Colonna is now occupied by Galleria Colonna, a large building completed in 1922 with an inner passage with shops. Here was Palazzo Spada al Corso not to be confused with Palazzo Spada alla Regola. This palace was also known as Palazzo Piombino as it was owned by the Boncompagni - Ludovisi, Dukes of Piombino, a little town in Tuscany facing the island of Elba, which they got from the King of Spain in payment for paintings they sold him. Palazzo Spada al Corso Dopo la descritta chiesa evvi il palazzo Niccolini, e poi dall'altra parte del Corso ed incontro alla gran colonna, si vede quello della famiglia Spada, che sta sempre alla disposizione de' nobili forestieri, che vogliono dimorare lungo tempo in Roma. Go to or to Book 2 or to my Home Page on Baroque Rome or to my Home Page on Rome in the footsteps of an XVIIIth century traveller.